The race with winter started in earnest this weekend. We had a hard frost Saturday and a real freeze warning last night. I’ve brought in a bushel and a half of tomatillos just this weekend, and I left another half bushel to freeze. I also did get two butternut squash from the potato patch. The frost two weeks ago really did get the volunteers in the potato patch to ripen. I brought in the corn, the last few peppers and the cilantro we just remembered as well. I covered the celery last night, but the forecast is now rain and frost for the entire week, so they’re in too. I went to pull the edamame for the sheep, and discovered that not all the pods had been frozen, so that too is in the house for picking over. Everything we need to process is now in. The onions, leeks, carrots and parsnips are still out. If my magic wand comes out the shop we’ll have a proper root cellar, otherwise, the basement will do. We decided to break down and buy enough chilies to make salsa verde from our tomatillos, and then forgot to get them on our hen run yesterday. Fortunately the tomatillos will keep for several days even after I’ve husked them into the pot. Whatever doesn’t fit in the pot go into the dryer. Our combined hen and apple run Sunday got us a bushel of apples. The other guy had hit Walpole cemetery, so we only got two teeny ones and surprisingly a 5 pounder under a hydrangea, thirty feet from the closest oak tree. It was salvageable, but we lost a lot to mold. We stopped at Alyson’s for a bushel of apples, then found that the monster hen in Brattleboro had been eaten by something. (I don’t think it was cut. It had gnaw marks even last week.) We did find a teeny pristine one on the same tree. We ear notched the new litter of piglets and now I need to rebuild the chicken coop door that the bear ripped off before I leave for the week. I got the Fall flag up for Lisa, while it is still Fall! Doing the harvest took time away from other winter preparations, but life is much yummier. This entry was posted in Fall, Flags, Gardening, Harvesting, Pigs. Bookmark the permalink. Post a comment or leave a trackback: Trackback URL. 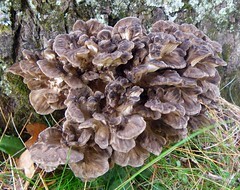 Wonderful photo of the Hen of the Woods, Love your write up and always enjoy stopping by the site to see what is new. I love the phrase “the race against winter”! 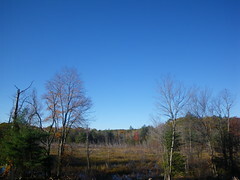 We don’t have your severity of weather but already my list of what needs to be done in autumn is a mile long. It is dark here by 7 now. How can I possibly be surprised that this happens every year? somehow every summer I get seduced into taking the light for granted. Lovely blog. Nothing lights a fire under one’s fanny like fall.